Has anyone noticed how many blackberries there are this year? In these times of climate change it seems that the plants have nevertheless been doing well….. We heard from our local tree ‘whisperer’, the incredible Gordon Field at a recent Cygnus Café meeting, that there are extraordinary energies coming through the trees from somewhere beyond our immediate sun which are supporting the earth and the plants… Certainly seems to be true of the blackberries! Blend your shelled hempseeds if you are using these – definitely the best option as less processed than bought hemp milk. Use water from an *alkalinity filter jug for purity and to balance pH. We sell this on the www.randrme.com website, along with all the products listed above apart from the fresh fruit. Then add fruit and powders. 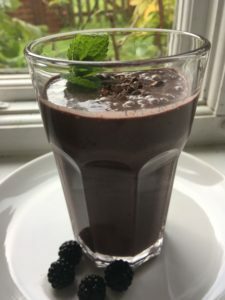 Adjust taste as you prefer, and serve with a few blackberries, a sprinkling of cacao nibs or a sprig of fresh mint. Divine indeed!